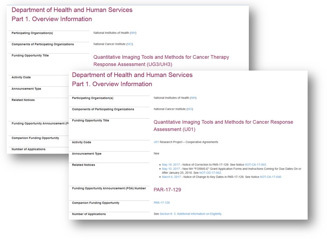 Applicants with ideas for research that will require development and optimization of decision support tools or methods for clinical research are encouraged to read PAR-18-248. This announcement guides the applicant through the requirements to create a two-phase response. In the first phase, the assembled research team is expected to develop and optimize methods or tools that will measure or predict the response of tumors to cancer therapies, reduce bias and variance in image data collection, or improve therapy planning during cancer clinical trials. The second phase must be used to validate the tool or method using clinical data, either retrospective or prospective. Duration of the phases is chosen by the investigator. A one-year or two-year phase 1 effort can be selected. During this period, the research should focus on creating and optimizing at least one clinical decision support tool or method intended to measure or predict therapy response, aid in treatment planning, or reduce physical error in clinical images. At the end of phase 1, the research team will report progress to NCI in the form of a written report and a teleconference presentation (WebEx, or equivalent). On the basis of this report, NCI staff will decide if sufficient progress has been made to initiate the phase 2 portion of the research. Here, the team is expected to validate the tool or method against clinical data (retrospective or prospective). Exercising the tool or method in network challenges is suggested, and sharing the tool for others to use is recommended. The total time-period for the combined two-phase project is a maximum of 5 years. More details can be found in the program announcement. For research teams with extensive development and optimization of clinical decision support tools, program announcement PAR-18-919 is an avenue to show that the tool or method can be validated in multisite prospective clinical trials. This R01 mechanism has a time-period of 5 years and must focus on validation of tools or methods. Some modifications to existing tools can be supported, but the majority of the effort must be in multisite validation. Participation in network or other challenges in which tools are tested against one another with a dedicated image data set will be supported under this announcement. More information is provided in the program announcement.